In the Water Bird Year of 1263, he gave the responsibility of looking after his monastery to his younger brother Tashi Lama, and went to Yishod Riwoche in Do-Kham province, East Tibet. In the Fire Rat Year of 1276, during the 5th Rabjung Cycle, he established Taklung Kagyu Riwoche Monasteries. In particular, he displayed an unequalled prowess in miracles and clairvoyance, and even the Indian Pandita Gyanatapa and his consort the wisdom dakini Kundali came to his door to offer Upara's treasure teachings. Gradually, he achieved the state of ultimate union, which is the state of Vajradhara in this lifetime. One evening on the third day of the ninth Tibetan month of the Fire Monkey year, 1297 AD, in the Fifth Rabjung Cycle, he said, "I came to this world in the form of Heruka and I will pass away in the same way." He wore the six bone ornaments, and holding a vajra and a bell in his hands, he crossed his two hands upon his chest. He sat in the posture of Vajradhara, dissolving his body into the Dharmakaya. Due to his enlightened activities, his disciples reached far and wide. After him, the two main monasteries came to be known as the two main seats of Taklung Kagyu. His students consisted of many scholars and accomplished masters in the two main monasteries of Taklung Kagyu and many other branch monasteries and centers in the three provinces of Tibet as well as in China. Taklung Thangpa Tashi Pal's main seat came to be known as Taklung Yarthang, and Choje Sangye Won Drakpa Pal Ozer Zangpo's seat came to be known as Taklung Marthang. In each of these two main seats of the Taklung tradition, there were three main masters known as the Three Kyabgons (Refuge and Protector). In Taklung Yarthang, the three Kyabgons were: H.H. Taklung Kyabgon Shabdung Rinpoche, H.H. Taklung Kyabgon Matul Rinpoche, and H.H. Taklung Kyabgon Tsetul Rinpoche. 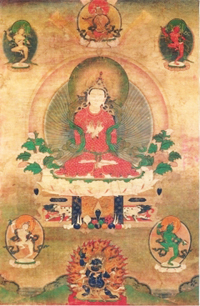 In Taklung Marthang, the three Kyabgons were: H.H.Taklung Kyabgon Phakchok Rinpoche, H.H.Taklung Kyabgon Jedrung Rinpoche, and H.H.Taklung Kyabgon Shabdung Rinpoche. The detailed history of these masters can be found in their respective biographies.